Yesterday (28th July 07) myself, Ravi, Shiva, Raaghu, Prashanth and Sharath had being to “KWAB – The Karnataka Welfare Association For The Blinds” to understand the teaching req. and see the place. In brief about the KWAB: KWAB is a NGO, formed in the year 1967. Association is serving the visually impaired and other persons with disability. Currently KWAB is run by Mr. S P Murthy who him self a visually impaired person. Also a lecturer in MES college, he takes English classes from morning till afternoon. After the college he spends time at KWAB staying there . Currently the Association are having branches in Mandya and Devanhalli. Devanahalli has integrated school and hostel facility for around 40 students, this branch is having a mix of Blind, Deaf and Dumb children’s Mandya has house for hearing impaired students and gives training in tailoring for ladies. 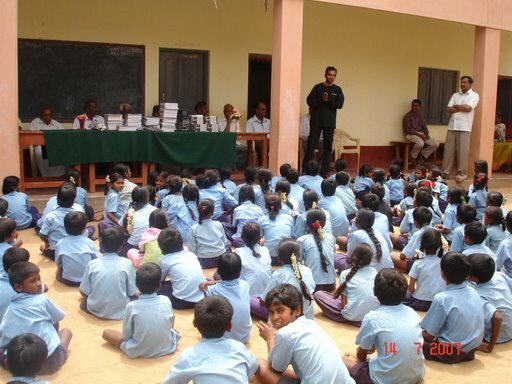 In Bangalore there are around 90 Students from the age 2 to 14. 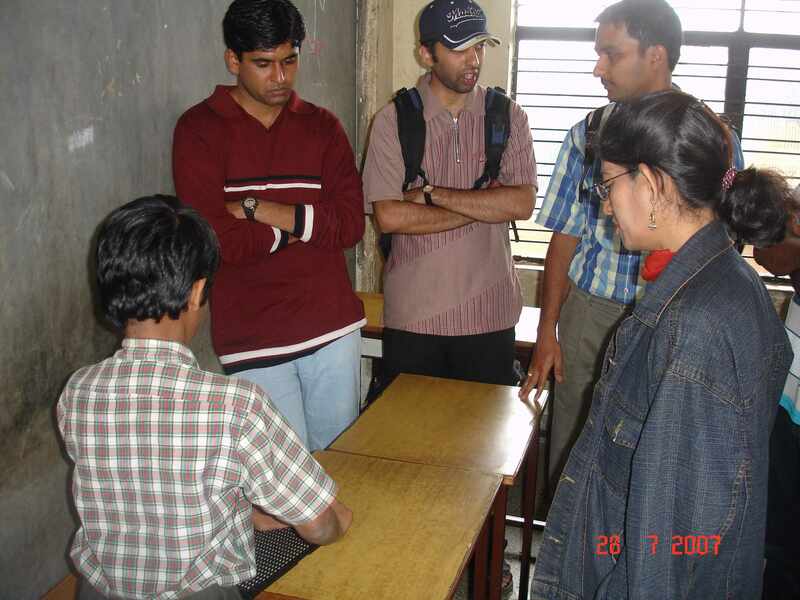 From 1999 KWAB started the blind school and syllabus is based on CBSE. This is a resident school where Association takes care of accommodation, food, cloth, study.. etc. 10 – 20 new admissions every year in Bangalore. Criteria for admission is blindness (complete or partial) and poor background. All the students here are from all the parts of Karanataka. These children’s are picked up from the different parts of the Karanataka where the parents of these physically and visually challenged children’s thinks that they are burden for them and leave them to live isolated life or left in the streets. Association gets this data from the Census which is issued by the state govt. All the study material at KWAB are build in house and library is maintained. CBSE syllabus is converted in to the Braille and materials are kept in the Library for reference. All this conversion of books are done by the students only. KWAB also maintains Braille library and audio cassettes. Absolutely there is not support available from the State Govt. or Central Govt. from the past 4 years. Currently the KWAB is run purely on the public donations. Admin Manager was mentioning that Students here are skilled in making handicraft items also. Which they are thinking to put in exhibition which would be a help full for raising the funds against the day 2 day expenditure. Along with the Handicraft Admin Manager updated that students are doing cultural activities which also some times adds up the funds. But at the same time she said that these kind of cultural activities are diverting the students attention as they are visually impaired and cannot concentrate on studies. – Detailed requirement is expected from Admin Manager in a days time. Below are the req. which we understood with the interaction with Admin Manager and which will also be covered in the detailed req. mail which she will send. As per the Admin Manager any kind of help is fine. From our India Sudar team we can provide the education related support and more also based on the activities and budget, but for others day 2 day needs we need to really think in some alternative way. – Used cloths but good ones. (Washed and Ironed neatly). Regarding the same I spoke to my Aunty who is a high school teacher to check with there students parents who can give used cloths so that we can distribute. – Any electronics item (radio / cassette player / cd player etc) which are in usable condition. – Contact admin guys from our office to set up a exhibition for a day or two to exhibit and sell the handicraft items. Visited Iniya Udhayam, Chennai, TN. 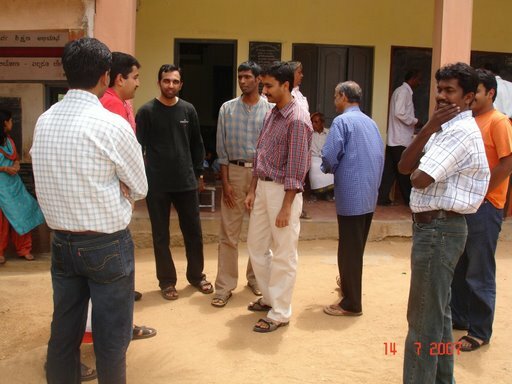 Last Saturday(28th Jul 2007), I visited Iniya Udhayam Charitable trust @ Avadi. Here we are supporting Spoken English class for poor students. 1st set of batch was over by May. As far as myself is concerned, the result was good. When, most of the students don’t know ABCD, making them to speak atleast few words in just 5 months is not an easy job. J (Hope u all read my mail few months ago, reg the coaching of the faculty.) Mrs. Gayathri who was taking the class, is unable to continue, as she is pursuing her P.hd now. So, from Aug 1st onwards, a new staff is coming. He has finished 3 MA. (English, french and another one) He is a retired school teacher. BTW, Iniya Udhayam has acquired new building(rental only) in Avadi. SMILE foundation has donated some computers for the home and also the syllabus. The syllabus is gud. Its prepared having poor plus two students in mind. It has four parts. 1. Spoken english, 2. Computer Skills, 3. Retail Marketting, 4. Gender Understandability. It’s a 6 months course. When I went thr, one of the trustee gave a topic in tamil and made them to act in english. The full conversation was translated by the students themselves and their performance was gud. Most of the students are drop-outs after plus two. 1. SMILE foundation ask them to arrange the faculty and payment. For spoken english class, we are already supporting them. For, computer faculty, they arranged a new staff. Apart 4m taking classes, he is in-charge of full administrative work. So, he demands Rs. 6000(Six thousand) per month. 2. For the new place also, they need to support their monthly rental. Rs. 6000(six thousand) per month. At present, thr are no regular donors for the home apart 4m ourselves and one another grp(which provides supplimentary food). After they get regular donors for these two needs, they decided to start a tuition centre in the evening, for the govt school students in the nearby locality. We are responsible for what we are and whatever we wish ourselves to be. –Swami Vivekananda. Last Week, i had visited the Government Children Home for Boys @ Chennai, an organization for abandoned, runaway and exploited children of more than 210 students and met their Superitendent Mr. S. Thansekara Pandian. About Government Children Home for Boys, Royapuram, Chennai. Exploited and abused children end up in Juvenile Homes (called Children’s homes) in the State of Tamil Nadir. The children are detained and are brought before the Govt. Reception Unit at Royapuram, which is the center for the children in need of care and protection in Chennai District. Each child’s case is registered and is investigated by the Probation Officers. Until the case is over, the child stays in the Reception Unit for shelter. The Govt. provides for the basic needs of the child such as food, clothing and shelter. There are separate dormitories for boys and girls. The number of children ranges from 125 to 150 children at any moment in time. These children are brought before the Juvenile Welfare Board (now re-constituted as the Child Welfare Committee under the new Act), which decides the future rehabilitation of the child. Children who have no other option of family care are placed in the Govt Boys Home or the Govt Girls Home by the Board. At these Homes there is a residential school and the children stay here till they are 18 years of age. At present their needs are Kitchen Vessels, Water Pots, Stationaries, Notes, etc. Based upon our approval to support their needs, i will get their needs in detailed. We have started 10 Tuition centers in Gudur Thaluk, Nellore District – 524 410, AP to support 297 students from following villages. As you know, Last year we started 5 Tuition centers in this District, Now we are increased to 10 Centers. Still we are planning to open 6 more tuition centers & Looking for the funding. I have attached project reports(10) for your reference. Provided education material to 499 Students from 16 Tuition Centers in Gudur Thaluk, Nellore District, AP. We have started 16 Tuition centers(10 Centers from India sudar & 6 Centers we are looking for Partner to support) in Gudur Thaluk, Nellore District – 524 410, AP. We have provided very basic Education material to 499 Students from following 16 Tuition Centers. Details of the student, Sandhya who is going to studying 6th standard is verified by our India Sudar Member Sivagami (SYSTIME) and came to know that there family was very poor. Her father had expired and her mother is sick and not able to go for work, but also she manage to get 96% marks in her 5th Standard Annual Exam. So, i hope we can very well proceed further to help her to continue her education. Her mother paid the Tuition Fees & Books Fees by borrowing money from neighbors and now they are unable to pay the Term Fees & Monthly Fees. So, we will try to pay the Term Fees & Monthly Fees of this girl. I came to know that an poor girl named Sandya studying 5th Standard “B” Section and got 96% in the Annual Examination at Shri Dhanraj Misrilal Surana Jain Vidyalaya Matriculation School, East Tambaram, Chennai and her father had expired and her mother undergone two major surgeries so she is looking for financial help to continue her studies. Any of our member can find out more details about this student and check this girl and his family before we proceed further. Herewith, i had attached the Last Year Progress Report and Fee Payment Detail of that girl. Last weekend took us to a village called Chikkakurugodu ” in Chikbellapur distict(90 Km from Bangalore ). Our member Prashant had taken requirement from the local school there for stationeries. Prashant, Usha, Vijay Babu & few of our IS members were quick to collect funds for this. Vinod and Prashanth were purchased the notebooks on Friday itself. Prashant, Santosh, Ragavendra,Tejaswini,Vinod, Reena , Ram, Ravi , Udhay, shiva. 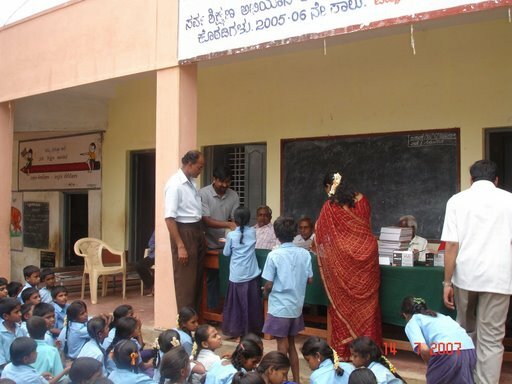 School is located at Chikkakurugodu 4 Km from a town called Gowribidhanur, Chikbellapur District, Karnataka. – The school is a govt run school. But govt provides only text books, not the note books. – The school headmaster Mr.Hemachandran contacted Prashant& Family with his requirements. He felt this could give more motivation for the school children to study. Most of the students are from very modest background. The headmaster is very encouraging and make sure that all kids in that village are going to school. – The school strength is 206, from Std 1 to 7. They have 6 full time teachers. Since there is shortage of 1 teacher, some classes would be combined together. 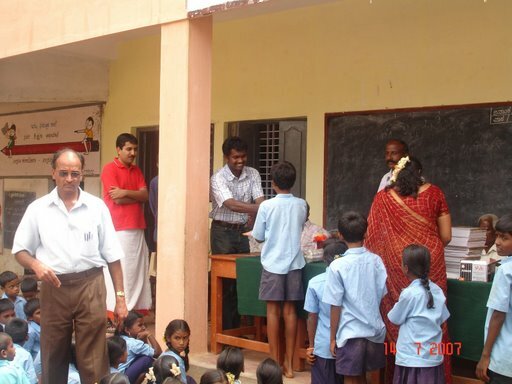 – The school had arranged a very neat ceremony type programme for books distribution. Our IS member Ragavendra gave some good speech to inspire the students. – For classes 8Th and above nearby town Gowribidhanur (3 Kms away) caters. – The programme was attended by local Panchayat members and local well wishers. Our sincere thanks to Prashant’s family members, especially his uncle and his family.The school headmaster & teacher very enthusiastically coordinated the event. After the event, Prashant’s family greeted us with great lunch!!. Thanks a lot for the feast ! Prashant to be in continuous touch with the school for guidance and any future requirement they might have. India Sudar Team , Bangalore. Attendees from India Sudar Team : Durga , Michael , Shekar from Tanjore, Ravikumar , Gopal Krishnan, Shiva, Sriram, Ragavendra, Ram Ganesh, Vijay Babu. Mrs.Durga & Mr.Michael live in Syndney, Australia. This young couple married for 3 yrs now, they have been involved in various social activities world wide. This includes their work in Japan for 2 yrs, 6 months of Tsunami Affected Areas in Srilanka coordinating with UN & other NGOʼs. The couple had contacted us before visiting India & their willingness to visit Indira Gandhi Internal School. So on Saturday we took them all to the place , to get a feel of the circumstances. The School manager Mr.Gracian had explained their situation and their needs and given a list of most essential requirements. 1. There are 310 students at this school and they get lunch from Mid-day meal program, but they need 40 kg rice for their dinner everyday. They don’t have constant sponser for this. 2. Since the total strengh is increased from 200 to 310, they had asked us provide 100 eating ever silver plates and 200 ever silver glasess. 3. There are 5 students studying PUC at different (akshaya school)school, (coz Indira Gandhi school supports until 10th Standard) and they are spending Rs. 100 for bus fares every day. (Rs. 20 per student, For 5 students – Rs.100).This is becoming very expensive, the only solution getting bus pass. The bus pass fare is Rs.900 for 1 year for 1 student. They need Rs. 4500 for 5 students to get bus pass. 4. We had discussion with all teachers – they have 9 teachers now and they planned to have 3 more teacher in this year. Salary is pending for many teachers and Management don’t have fund to provide salary. This is one of the most essential requirement. After hearing all the require! ments, we had detailed discussions with Mrs.Durga & Mr. Michael, and then, we decided to suppot the following projects, which are considered as essential & having wide impact. Agreed and executed projects for Indira Gandhi School with financial support from Mr. Michael and Mrs. Durga Owen. Impact : This would solve the food problem for more than 10 days. Impact : Total bus expenses is reduced. Money paid to Indira Gandhi School Management, they would get bus pass on Wednesday. All the above projects are executed on Sunday (08th June 2007) with the great help of our friends. WE USED CASH TO EXECUTE ALL THE PROJECT AND FUNDS ARE NOT ROUTED THROUGH INDIA SUDAR ACCOUNT. SO WE WILL NOT CREATE ANY PROJECT REPORT FROM INDIA SUDAR. – This money would be transferred to India Sudar account and India Sudar would issues the cheque to teachers directly. – Project report would be created once the money transfer to india sudar is completed. Thanks a lot to Mrs. Durga Owen and Mr. Michael Owen on behalf of India Sudar and Indira Gandhi International School. Special thanks to Durgaʼs Mother Mrs.Nagula and her friends Mrs. Anushya, Mrs Sashi who initiated this whole process. On their consent, Durga traveled here to execute the project. We are deeply touched by all their dedication. Without Mr.Sriram & his Father we would not have been able to purchase food items at best rates. They gave their whole hearted effort on this Sunday. Thanks a lot for Sriram and his father. Sriram arranged a truck to deliver food items and he negotiated for Rs. 250, we we expecting that truck driver would ask more money due to more distance than he expected. The surprise was that truck driver Mr. Moorthy – charged only Rs. 150 and he said that he also wanted to contribute for this noble cause. It was a real surprise !! Thanks to Mr. Murthy, Truck driver. We sincerely thank all who were responsible for this execution. This gives us more confidence to do take up bigger projects creating greater impact for the needy. Will upload the photos to blog in a day or two !